AS MUCH AS I WOULD LIKE to commute to work in the sporty Tesla coupe, I cannot really afford dropping €100,000 into a car, even though it's a green car. So when Tesla announced the availability of an electric sedan, priced around the point of a BNW 5-series, I started looking closer at the car. The Tesla Model S, which could get 225 miles on a single charge, would and cost $60,000. In practical terms, when you consider shipping the car from California and paying at least 21% sales tax in Ireland, the Tesla S will cost at least €60,000 in Ireland. The California tax incentives are helping Tesla push unit costs down. Better battery performance helps eke out the 225 mile range. That's a Dublin round trip for me, one that would leave me uncompensated for mileage, however. 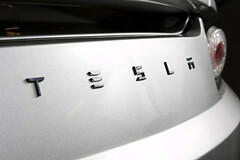 Damon Lavrinc -- "Tesla confirms Model S sedan, 225-mile range and $60k" on Autoblog. Leftland -- "Tesla to offer all electric sedan too." TODAY'S SUNDAY OBSERVER GETS five stars in my book as "best Sunday paper in Ireland for June 2008" because several themes inside accurately point to trends that will define the first decade of the 21st century. I made a Qik video about it. Specifically, several writers zero in on the effects high energy pricing will have on the way we live and many advertisements take up the eco perspectives in how brands reposition themselves in a more miserly environment. Many of my friends point to the demise of print media and maybe they have a point. If so, titles like The Observer have it right. Their online presence is solid and their hard copy inserts are sure to appeal to those like myself who will hold onto them for months. I'm keeping The Observer Book of Invention  for my fourth year Mass Communications and Culture module and we will retain the 29 June 2008 "Escape" supplement  for several trips we plan to make to the States. THERE'S A LOT TO BE SAID about placing your stool online and as one of several hundred Irish bloggers using Twitter, I have an opinion about using Twitter as a place to chat. After more than 6000 messages there, some in the public eye and others direct messages, I cannot say it's my favourite cup of tea. That's because Twitter never wanted to be more than a minimalistic place where you could occasionally hook up and chat. Twitter is like a public bus. You jump aboard for a while, mingle, and maybe catch up with messages on your phone. But as many people with more patience than myself have noticed, it's not a place you can go if your friends are an ocean away in time. That's because it's hard to go back in time with Twitter and it's sometimes difficult to figure out if anyone was trying to reach you on Twitter. A lot of my Twitter friends are getting browned off about Twitter's reliability and have started limiting their visits (see the stats above), but, hey! I'm not complaining. Twitter is free and it satisfies the minimalist urges inside me. And it verifies I'm more interested in threads of conversation that actually congeal into productive action. Sometimes those threads start on Twitter but they are more likely to coalesce in some other space. I hang out as topgold on Twitter. Mike Arrington -- "Twitter Conversations Come to a Screaming Halt"
Mark Hopkins -- "My Last Post about Twitter, Ever"
Mark Hodson -- "What's more irritating? A dead Twitter or whining users?" EVEN AFTER TWO YEARS, we still don't know our house very well. Take this week, for example. I endured excruciating pain while using my USB dongle from O2-Ireland until a little bird suggested that I check over-the-air data speeds outside my house. So I pushed little Mia to the west and saw EDGE. Then I reversed track and saw 3G on my Nokia E90 until I got in front of my home and started seeing the little 3.5G icon flicker on my phone. The lightbulb flickered inside my head at that very moment because if I could see 3G on the path, I certainly should be able to see 3G from one of my windows overlooking the same position. And so I started a serious site survey of the eastern side of my home. In just a few moments, I found solid 3G over-the-air signal on the top floor of my three storey home. I snagged it as a screenshot to the right. This is sweet! I'm going to flex my mobile data connectivity and attempt to break it. I'll try Skype conferences and also several session of Online Meeting Rooms. I doubt that I'll disrupt my connectivity, mainly because no one else living within a half mile radius uses O2-Ireland for high-speed data access. I know that could change. For now, I am living in an over-the-air sweet spot and I thank the wireless gods for that. More speed tests in search of faster data pipes. SOME PEOPLE SAY life runs in cycles and if that is true then I am back where my communications ran through MARS and my daily vector is governed by MARSA. Both of these acronyms are a foreign language where I work today but in the 80s they represented a special connection to home and family. WHILE STANDING IN FRONT of 24 third level educators at the Dublin Institute of Technology to present my after-lunch views on social media in education [28 minute MP3], I realised I was going to show some things that would have no traction. I also know a few of my reliable social media tools would get a good review. In a nutshell, here are free or low-cost social media tools I use in the creative multimedia degree programme at Tipperary Institute. 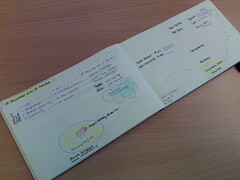 Some of the tools I use were in a single-page handout at left that I gave to the audience. HAPPY BIRTHDAY, KITTY! We have to look west, across the Atlantic and into the Arizona desert, when wishing happy birthday to Kitty, so we hope our little birthday greeting can land on her iPhone. We made a short Qik clip in Dublin, at the front of a shop where we'll visit together when Kitty lands in Ireland a few months from now. In the meantime, we hope we can figure out how to share short clips we make in Ireland with her iPhone in Phoenix. I don't think the Qik player will launch on her phone and without a test bed of our own, we're just going to repackage our clips into Quicktime movies, then push them out as iTunes subscriptions. 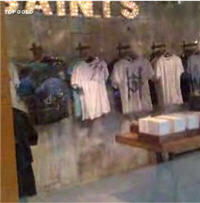 Maybe we'll have an entire tour of Ireland unfolding in those movie clips so when we're together, we can revisit the places like the clothing shop in this Qik clip. SEVERAL MONTHS AGO, while walking my dog alongside Golden Road in County Tipperary, a text message postulating the effect McLuhan would have on toasters appeared on my phone. I followed it back to its source and discovered an interesting channel on Jaiku (#ixdm78). The short bursts of text on the channel helped me revise a lecture I was preparing on McLuhan and validated the role of microblogging in my life. Today, I share some of those lessons and offer practical tips in social media for a small group of educators attending DIT e-learning week in Aungier Street, Dublin, Ireland. I attend the DIT e-learning week every year, because it's interesting and the group dynamic chisels away at some of my work processes. The give-and-take in the workshops amount to a sort of peer review for me. This year, it is time to talk about the role online social networking plays in better higher education. WHEN OUR ACADEMIC YEAR starts in September, we're running a semesterised Media Writing module and one of the first assignments involves first year (freshmen) students writing what they think will happen to their phones by the time they graduate from their Level 8 creative multimedia degree. 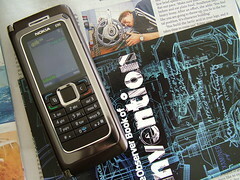 Symbian wants to know where the smartphone space is heading between 2012-2015. Around the world, university students have until the end of September to submit their essays. Ten winners will will be selected, each will get 1000 British Pounds (1991.50 US Dollars or 1263.48 Euros). ALTHOUGH I AM IN THE MIDDLE of a self-imposed broadband cap, I decided to make a Qik video of my take on Sunday tech news in Ireland. 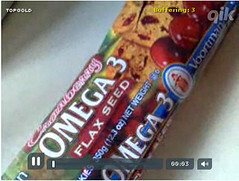 Part of the video includes important pointage to LouderVoice review items, such as the truly excellent Omega 3 Cranberry-filled flax seed biscuits. I immediately renewed my pledge to keep these clips as short as four-minute music videos--something I failed to do this week. One of the facts that might go unnoticed by readers is that it took me more than 25 minutes to upload this 8-minute video. That's because my O2-Ireland 3G SIM enjoys only 28.8 speeds where I live under the Rock of Cashel's shadow. Nonetheless, I think it's important to test drive my life at over-the-air broadband speeds and today's Qik video is proof that without true broadband, you really have a slowpoke existence. In a tech part of the modern world, it might as well be a print-only existence. Speaking of that print world, here are some items I spotted that caught my attention this week in the Sunday newspaper print editions.